Building a fence can add value to your home, protect your property from pests, and add tremendous beauty. 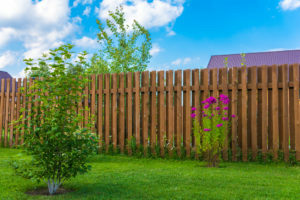 You’ll end up getting the most out of home improvements like fencing if you understand what goes into selecting the best wood for a backyard fence. Here are a few things you should consider before you pick the type of wood. Right off the bat, ask yourself about the main purpose of the fence. How durable does it need to be, how much maintenance will you be able to do, and what is your budget? In addition to the type of wood you select, you also have the choice of the grade used (construction, clear, select, or premium). Also remember that all timber is prone to warping over time, but some types of wood are better than others. Although it may be cheaper to build it yourself (DIY), if you are looking for a finished product that will not only be delivered quickly but also with customizations, a reputable fencing company may be your best bet. Different types of wood have advantages and disadvantages depending on utility, style, and your budget. You have a choice of many gorgeous-looking fences that also combine durability and other benefits. Uniquely beautiful and long-lasting, the durability of redwood makes it a favoured selection among expert fence builders. Expect to pay a premium for quality redwood. The advantage of cedar is that it holds up against the elements. Natural oils act as a deterrent against insects, fungus, and algae. Cedar is also great at absorbing either stains or paint. Pine is one of the few woods that can be pressure-treated so it won’t decay for at least 20 years or more. However, it can often become cracked or split due to the natural drying out that occurs with all lumber. An ever-popular fine-grained wood that has a plainer appearance, birch can be an inexpensive and adaptable solution for fencing. The benefit of spruce is that it is inexpensive; however, this can come at the cost of durability. Spruce may be prone to warping in damp climates, and it is attractive for insects. A traditional oak fence can be long-lasting, and very aesthetically appealing. White oak is very durable and can handle the harshest Canadian winter. Oak is ideal for those who require a very strong fence (ie. horse owners). Looking for expert advice on how to find a beautiful wood fence that adds value to your home? Toronto-based Total Fence Inc. has the acumen to design and build exactly what you need. We are here to help with all your fencing needs. Want to know more? Feel free to contact us with any questions.